*A must have car accessory. Useful tools to help you in case of a break down or getting stranded. A great way to always be prepared for the unexpected. * Useful tools in case of a breakdown. Sturdy Polypropoylene case to keep your tools organized, 1/4" Drive socket, 1/4", 5/16", 3/8", 7/16", 4mm, 6 mm, 8mm, 10 mm, znd 12mm sockets. 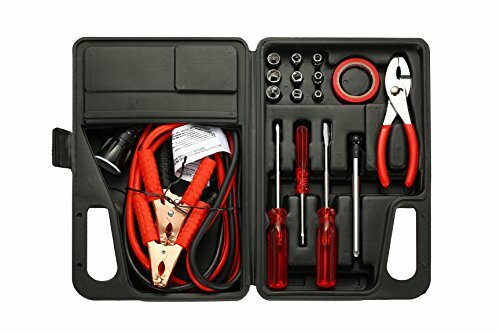 6 gauge jumper cables, tire gauge, slip joint pliers, # 2 Phillips screwdriver, 1/4" slotted screwdriver, 1/4" drive spinner handle, electrical tape, knit gloves, flashlight, 6 pc terminal kit, 5 pc strip fuse, and 5 pc Zip ties. * Light weight and sturdy Polypropoylene case. It is compact and will need little space in yor trunk. * Makes a great gift for any vehicle owner. If you have any questions about this product by Moxava, contact us by completing and submitting the form below. If you are looking for a specif part number, please include it with your message.